Coldest days of the year are necessarily calling for some sort of food. Soup comes first; it’s meant to be hearty, soothing and warming. 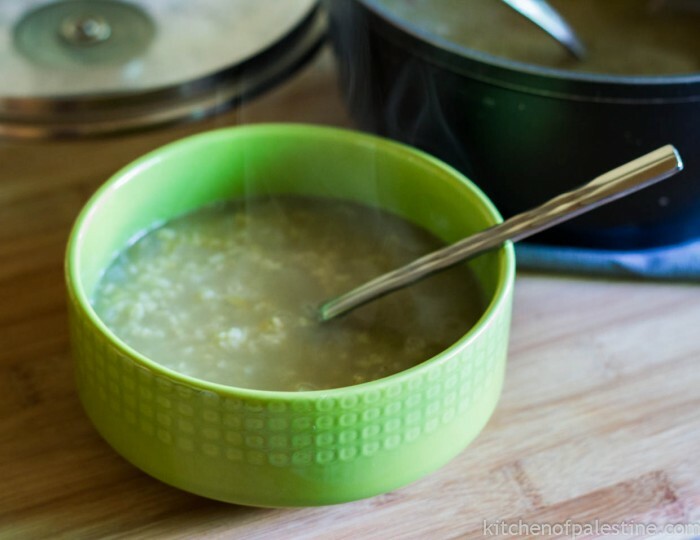 Freekeh soup in particular is great for those cold winter days. It’s filling and tasteful, yet light and easy to prepare. Freekeh is a roasted type of green wheat. Very authentic middle eastern food and still very popular. 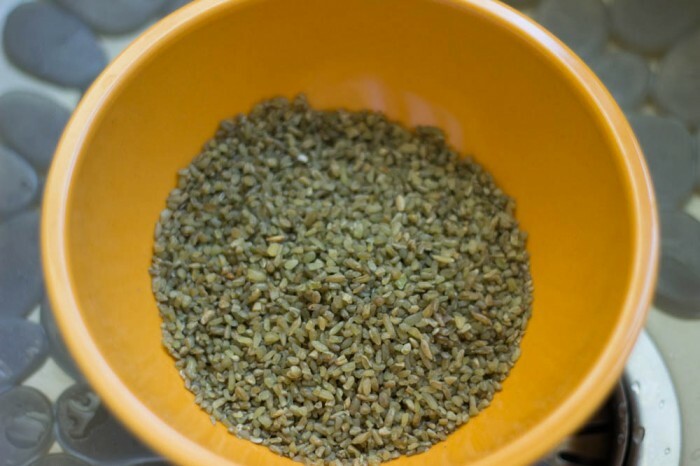 It comes in two types: cracked (typically used in soup) and whole freekeh. I will talk about the green wheat roasting process in a separate post later on. I found this freekeh product available online. In a pot over medium heat, saute the chopped onions with olive oil until lightly browned. Add freekeh and stir with onions for a minute or two (roasting freekeh before cooking gives them a richer flavor). Add vegetable stock and 6 cups of water . 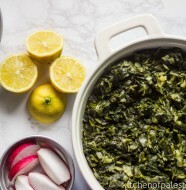 Cover the pot and leave it under low-medium heat for about an hour or until freekeh is very tender. Now after having them cooked, add cumin and salt to taste. 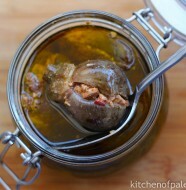 Serve hot with green olives and your preference of bread. 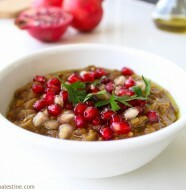 24 Comments on "Freekeh Soup (Shorbet Freekeh)"
This type of wheat is eaten in many different dishes in Gaziantep, Turkey in southeastern Anatolia. Interesting. No wonder that there are my Turkish products of freekeh and bulgur in our local markets. Yummy I make this frequently! I use chicken stock instead of veg but still a very yummy easy soup. Thanks for sharing! I use chicken stock as well, but I try to make a vegetarian version of recipes as much as possible. Can this soup be made with barley instead of wheat? I’ve never tried it with barley before. I think it would taste differently. It has a stronger flavor than wheat. Thanks for this recipe, I have some freekeh, but didn’t know what to do with it. For how many persons is this soup ? is Freekh the same as Bulgar? can i make it with Bulgar? No. Freekeh and bulgur are different. Both are wheat products but freekeh is made from green wheat while bulgur is dried cracked wheat. There are many recipes of soups where bulgur is an additional ingredient not essential. I don’t think it would make a good substitute for freekeh in this recipe. The reason you see so mant similaries in Turkish and Abab is because Turkey ruled the Middle East for a very long time Eman. the Arabs ruled Spain for 400 years so that is why Spanish and Middle Eastern food is alike also. Thanks for sharing this recipe with us ! Freekeh is one of my all time favorite foods. We cook it slightly different in Syria, we have it cooked like rice. I have a one question about the recipe, when you use cup as a unit of measurement, how much is that exactly ? is there an alternative measurement in ml or grams ? Or shall use the same cup all the way through the recipe ? Sorry for the late replay. We, as well, cook freekeh the way we do rice (بنفلفله) :) But this is the soup version of freekeh. There is a measuring unit in cooking called cup. If you don’t have one, just use any cup you have. I usually use spread-cheese glass! Re Ahmed Ghannam’s question, 1 cup equals 240 ml. Thank you for the explanation and recipe for this soup. My younger son bought a can of it at an international market before he left for an overseas job. I have been wondering what it is and how it tastes. I will definitely give it a try. I bought a pack of Palestinian Freekeh to try as an alternative to rice……Also buying that pack helps to support Palestinian Farmers ! They need all the help and assistance we can give them. I urge people to buy, its delicious. thanks Eman for the recipe. Is it ok to use lamb stock, please say yes because that is what i started already and planning to make it for ramadan iftar. Great recipe Eman. Tastes like my mom’s freekeh I had years ago. So hearty and warming for the soul! So glad to have found this recipe. So simple, ideal for a college student like me. I miss my mom’s freekeh soup so decided I’d try making it myself. One question though, can I use whole freekeh for this, or does it have to be the cracked variety?